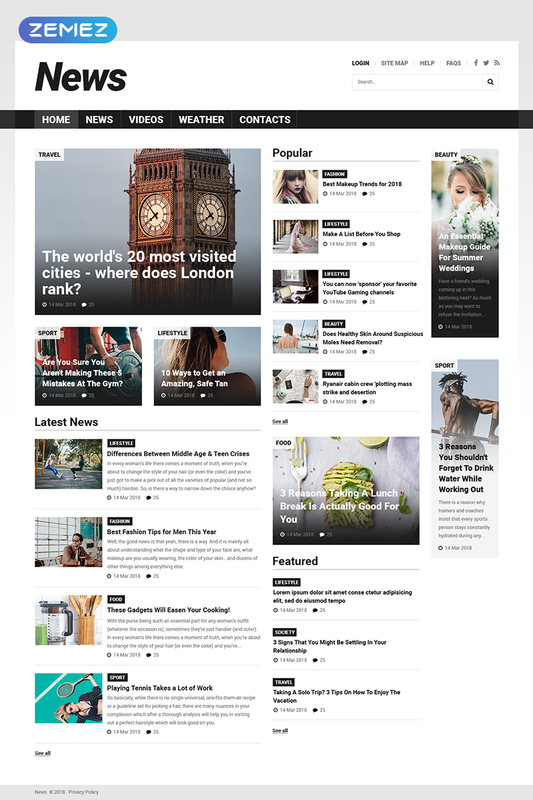 Pretty nice and functional template for a news website. Clean and works perfectly with joomla. I did have some questions about some plugins used, but as always they were solved immediately from the support group. Odpowiedni szablon do publikacji wiadomości , oceniam go wysoko pod względem wizualnym , jest przejrzysty. jedno co można dodać to w meni szablony więcej opcji do jego modyfikacji. You weren&#039;t the cheapest but we really liked the balance of bold and clean in this News design. We are excited to use this template for our redesign. We looked at about 20 templates and even proprietary non-joomla technology for alt weeklies. We liked this best and are just beginning the migration from a wordpress site. Check back in a month and see what we have done. Good template and clear, good coding. Also this template is responsive, so if you are looking for template for smartphones or tables this will be very good. We change colours a little bit and use it for women magazine. muy buena plantilla, el trabajo es profesional y f&aacute;cil de administrar. Select this template for its clean and organized style, we are developing a website for a nonprofit organization that requires well-defined fonts in high contrast, this because it will be visited by indigenous communities in their first contact with technology. Once again, we have relied on the excellent work of Template Monster, our main technology partner in web development. This template is original and is ideal for publishing information for a magazine or a newspaper with different categories of information; the look is modern and dynamic. It is versatile, the lazy effects for images, and the gallery for photos &ldquo;JoomGallery&rdquo; and videos are pretty useful, the modules included for managing the content are really practical, Komento is already installed and configured. The installation was easy, using the demo content. I am a developer, and I find in TemplateMonster a great variety of templates that fits my client&acute;s preferences, this template was easy to adapt to the colors of the brand. The client&acute;s project is to publish an online magazine for science and odontology, there will be a printed version too. So the template should have many areas to show contents of different categories, besides images in a gallery and videos. The template is a good choice for this project, when the magazine&#039;s staff saw this template they knew that it would fit their goals. The url for the site is www.cienciayodontologia.com, the domain was recently bought. We have found, in this template, all we needed to start, and as we all know if a new module is needed, it can be added at any time. If you are looking for a template for publishing a magazine or a newspaper try this one, because you will enjoy all the great features it has. Hi. Could it be suitable for latest Joomla version 3.7? Hello! I am interest to buy this template but I find it strange that it does not support photos in the article pages! Is this something that can be modified or not?